It’s fair to say I have gone a little wild with my clothes buying recently. I’ll happily admit that the need to fit in always has influenced my clothing purchasing habits. Team that with me not actually knowing who I am, be it a country girl walking the dogs in her Hunter wellies or blogger attending fancy events in her diamanté embellished ankle boots. 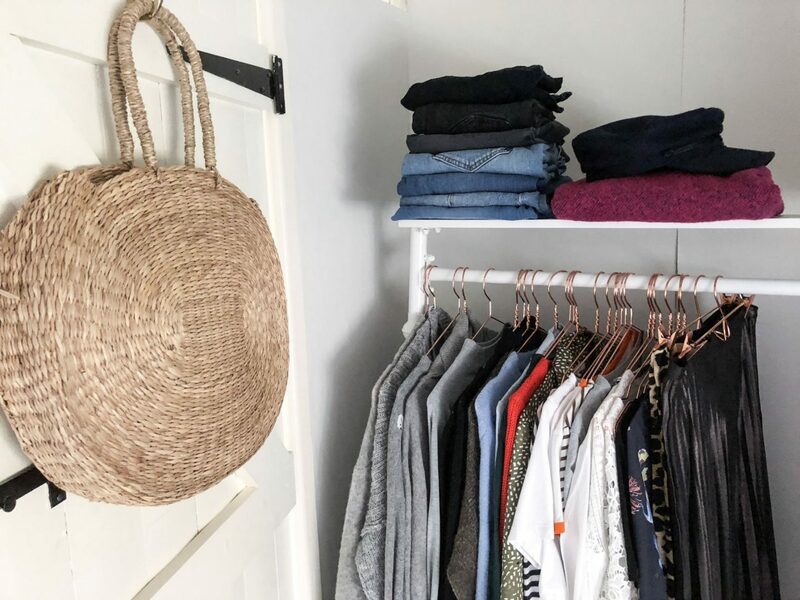 Standing in front of my jam packed wardrobe I just didn’t feel happy, which lead me to start reading The Happy Closet and to research capsule wardrobes on every blog I could read. I am an all or nothing girl so clearing out my wardrobe was actually easier than I thought. It turns out that being such an impulse buyer has its benefits, I wasn’t emotionally attached to anything and happy to send it to new homes. I started selling things on Depop and made the decision that I would use the money a leather jacket. Just a little disclaimer here, selling stuff on Depop got very addictive! Have I worn it recently or at all? Does it work with the other pieces that I love. If I answered yes to these three questions it went in my ‘keep’ pile, if I answered yes to two of the questions it went in the ‘maybe’ pile. Anything else went to the charity shop, the bin or my Depop page. Once I had cleared everything out of my wardrobe that I didn’t love or wear I spent some time on Pinterest pinning clothes and outfits that I loved and before I knew it a pattern started to emerge of the style that I am always drawn too. In short, oversized cardigans, Breton strips and all the denim. From here I have started planning my next purchases. I haven’t set myself a number of items to limit myself to. From my research most people aim for between 37-50 items including footwear for each season. This seems incredibly tough for a complete newbie like me. The perfect example of this would be my grey jumper collection. They are all so similar and yet all so different and all are completely loved. There was no way I could part with any of them. Here are the things I have recently ordered to start off my capsule wardrobe. I think this has to be completed in stages as I am still, as we speak listing items on Depop. It gets easier each time I dip back in to start the cull. However it remains to be seen as to whether this will make me feel happier or whether I’ll just slowly fill everything back up again! I will keep you updated. I’m excited to see how you like it– I think capsule wardrobes are the way to go! I purged my wardrobe a couple of years ago and went to the seasonal capsule method and haven’t looked back. We all tend to gravitate towards our favorite looks and pieces over and over so it makes sense to simply limit our wardrobes to that. If I don’t love it and it doesn’t make me feel good it’s gone. I used to suffer through too many days where I was dying to get home to get out of clothes that I didn’t like or weren’t comfortable– the epitome of stupidity– for clothes and looks I admired on others. I’ve learned to admire others’ looks without thinking I should automatically replicate them. I definitely feel the same where I have worn something that I thought was trendy but felt so uncomfortable. Ive been an adult for ages I should really know that its not worth it by now! I love the jigsaw Bretons! Ill have a look at that blog now, thank you for the recommendation! Thank you! Its early days, it will be good for me to change my spending habits too! I’m so going down this route also! Instagram is a bugger for making me buy clothes which are not ‘me’ but have a hype around them, so I feel like I’m missing out if I don’t buy them and then I never wear them. I went on holiday recently and only wore half of what I took because I realised the other half was stuff I didn’t like/fit/suit. Such a waste of money and it made me quite annoyed, I thought I knew better at 30! I was also going to recommend Unfancy. That’s where I’m getting my starting point from. Also, there’s s British youtuber called Anna Newton/The Anna Edit who has an amazing capsule wardrobe! It’s her who has inspired me to consider a capsule wardrobe (and recommended Unfancy). I think you’d like her style! Amazing, well done Cara. I did a seasonal capsule wardrobe for a year and had for each season 38-40 items. I really did enjoy it and getting dressed each morning became really easy. I am an emotional shopper, i shop when im stressed, excited, feeling down..well you get the point, basically i just love to shop. Doing the capsule wardrobe for a year taught me to only buy things that i absolutely love, to not shop on a whim and to buy things that remix well with other items. I sit an try and imagine if i can remix it and make 5 outfits with it and then if i can i know it will be a good purchase. After a year of mostly wearing neutrals, which my capsule mostly consisted of, and i did love, i got a bit bored and really fancied adding colour and interest in to my wardrobe. That’s what i’ve been doing for the past year and feel my personality is now present more in my wardrobe but i’m more careful with my purchases (most of the time.. i still get sucked in to insta-influenced purchases from time to time but i’m trying to curb that!). Good luck with your capsule wardrobe! Keep us posted on how you get on with it!